If you are a blogger, SEO or Search Engine Optimization is not a new word to you but if you’re just a starter, keep in mind, SEO is the only way for being friendly to search engines. Optimizing your blog with these ways will make your blog reach in first of search results and will help you get more traffic as well. We will be telling you the best SEO tricks to do on your blog with the 2017 search engine guidelines. Now we can discuss some common search engine optimization tricks to do on your blog. SEO or Search Engine Optimization is the process making a web page easy to crawl by search engines like Google, Bing etc. That was just a one-sentence definition, we can talk about How it helps your blog and How to do it. SEO is done on websites or blog to get a seat in search engine results, just like we book a ticket to watch a movie, we are making our blog to get a seat in search results. Making a blog or website and publishing it will not help you to get traffic and without traffic, what is the use of a blog. To optimize your blog we are not going to make it look beautiful because of the content matters. We can discuss How it helps your blog. How SEO helps your blog? As you can see in the above screenshot, there are millions of results on this topic and it is a fact that we won’t check all of them. We naturally click on the first result as we think it is the best content, if you’re a blogger, you will definitely need your post appear at the top in search results. In the above screenshot, there are many results. The first one is having better SEO. How to do SEO on your blog, let’s discuss it now. 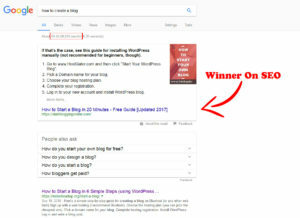 How to do SEO on your blog? There are many ways to optimize your blog and it’s simple as lifting a feather. 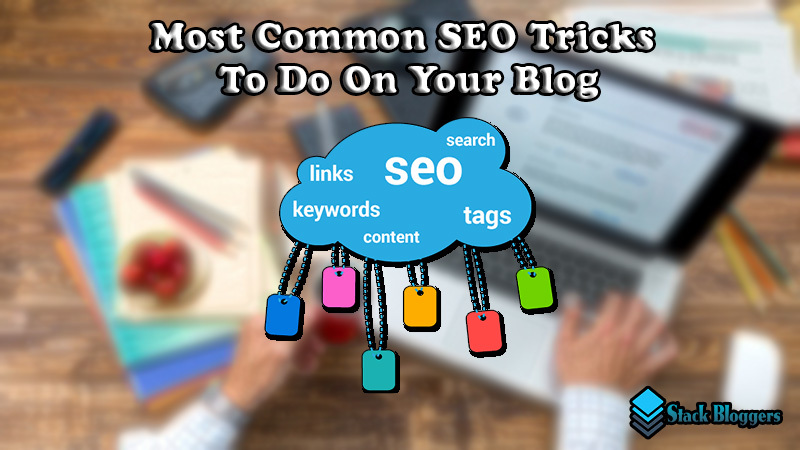 Let us introduce some of the most common SEO tricks and tactics to do on your blog. Themes play a major role in SEO. If it is a clean and good looking theme, it could help your blog to be optimized easily as the theme, it will support monetization. You also want to make sure that the source code is well coded. The source code of your blog plays a major role in SEO. It must be well coded, by making it child by child pattern. Here is an example. As you can see in the above example, the original code was just entered line by line and the optimized one was entered in a pattern. This helps search engines to crawl your blog easily. This is the most important part of SEO. There are many meta tags to use but we will tell you the most important tags. Meta Keywords Tag: These are words which will describe the content on your blog. The keywords you enter must be relevant to the content of your blog because too many keywords and irrelevant keywords will make your blog penalized by search engines. 10 is the recommended amount of keywords to use for your blog. A Sitemap is a page which will contain each and every content of your blogs like posts, pages, and much more. It is published to make it easier for search engines to crawl your blog. A sitemap of a blog or website is like this: www.YourBlogDomain.com/sitemap.xml. To submit a sitemap for your blog, you will have to sign up for Google Search Console (Webmaster Tools By Google) and add your site, then submit a sitemap to your blog. This will make your blog index faster on search engines. Robots.txt is the configuration for your blog on how your blog needs to be indexed by search engines. A Robots.txt will contain the sitemap page link and the other detailed information about your blog. A Robots.txt of a blog or website is like this: www.YourBlogDomain.com/robots.txt. To submit a Robots.txt for your blog, you will have to sign up for Google Search Console and add your site, then go to Crawl>Robots.txt and click submit or update. A Robots.txt must require a sitemap on your blog. If you find any broken links of your blog indexed by search engines, set a custom redirection to the desired page of your blog or homepage. People visiting those links will be redirected to the desired page. When you are ready to write a blog post do a research on the topic. You will definitely find some results which explain a lot about the same topic which you are going to publish. Write all the titles of the blog post you saw on the first page of search results. The title of your post should cover almost all the highlighted keywords of those blog posts. Your post must contain the minimum of 600-900 words if it is a topic which is trending worldwide or a topic which are mostly searched. Tags or Labels are used in a blog post to define what’s the blog post about and which category it belongs to. For example For this post, we cover the Best SEO Tricks so we can add tags like SEO & Tricks. Use relevant tags according to your topic. If you’re writing a blog post, it is a fact that you will have to insert some links for external reference which might be from Wikipedia or any other sources on the Internet. If you’re inserting an external link ( a link which is not from your blog) in your blog post which is not with nofollow attribute, it will index the external link you inserted and will affect your blog in SEO. Adding nofollow attribute: <a href=”https://www.google.com/” rel=”nofollow”>External Link</a> This external link with nofollow attribute will not be indexed by search engines because nofollow attribute is to make the search engines not to index the link you have inserted. You only have to use nofollow attribute if it is an external link. You can insert a link to your own blog without nofollow attribute. It will not affect the SEO of your blog. SEMrush: To find good keywords, get tips, and maintaining backlinks. Grammarly: To write mistake free contents by correcting grammar and spelling mistakes (Read Grammarly Review). SEO Profiler: To know about your blog’s SEO stats and get tips to get more SEO features. Image or picture you use in a blog post plays a major role in the part of SEO of your blog. An Image can describe what’s the blog post is about. We can understand it if the picture is relevant to the topic. How can search engines understand? That’s why there are attributes called “alt text” and “title”. JPEG is the best extension for an image to be inserted in a blog post. Adding a summary or conclusion will make readers understand the whole thing about the post at a glance. The conclusion must be descriptive and need to wrap the whole thing in a 1 or 2 paragraph. A permalink must describe the post and include keywords. Permalinks are the ones mostly indexed by search engines to crawl your blog. Make it small and efficient. Plagiarism is the way of changing a copied content to convince that the source is actually by the plagiarist. Copying contents from other internet sources will affect your blog. Search engines can understand the content is copied or plagiarised. Copying contents from other internet sources often lead to penalization of your blog from search engines. Using Shortened Links is a good way to earn money. It is considered as a spam by search engines. You can use the nofollow attribute described above to prevent this issue. Using shortened links will make people feel unsatisfied with your blog and it is not user-friendly. I recommend you to use these tricks and tactics on your blog. I guarantee that it will make your blog reach the top of search engines. You have any doubt? Please feel free to use the comment section, we are here to help you :). Thank You. Enjoyed reading such a long article. Nice way of writing. Can you write a post on How to import contents from Blogger to WordPress in a proper way, I want to know how. Sure, that’s a good decision that you have made to shift to WordPress. Nice And Very useful info, This article important and really good the for me is.Amazing write-up, Great article. Thanks! Great Article brother keep it up ! Thank You Ajsar for your good response 🙂 Stay Tuned for new awesome contents. Hi there. I recently found your blog making use of live messenger. That’s an extremely well written document. We’re likely to take a note of them obtainable returning to learn excess within your handy data all in one seo. Basically write-up. I will absolutely comeback.